Carabiner with Strap. Rubber ring water bottle holder. Strap color Black. Individually poly bagged. Carabiner is made of aluminum. Size: 5 1/4" x 1 3/4" H. Max Imprint Area: 1 3/4" W x 3/16" H. WT_100: 6 LBS. Paper-Proof: $10. (Required on all labels). 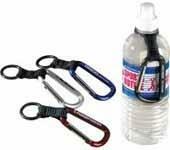 Buy Companion Water Bottle Carabiner Today!